Right now, you may be wondering what 2018 has in store for you. Well, there’s good news: 2018 is a year of illumination and a very exciting time to be alive. In numerology, 2018 adds up to 11, which is a power number that symbolizes illumination. This number signifies strength as it stands tall, side by side. The number 1 represents power, self, and strength, which is in essence very powerful because there are two of them, doubling the power. Standing side by side, the 1’s support each other, see each other, and recognize each other. This means we are being illuminated by seeing our selves and our shadow aspects. We are recognizing that what’s in the world around us it is also in our selves and what is within ourself it’s without ourselves. We recognize that the outer and inner worlds are like looking at the mirror. In the real sense, the 11 stands as one, the 2 aspects of duality united. According to Chinese astrology 2018 is described with the word ACTION. 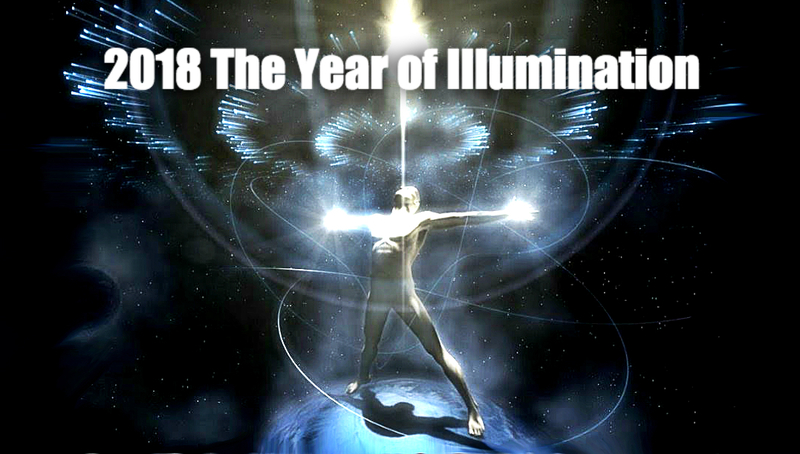 According to numerology 2018 is described as the year of ILLUMINATION. Putting these two points of view together we can see this year as the perfect time to put in the necessary work towards enlightenment, towards awakening and becoming the true person we were always deep inside. It’s about taking action to illuminate your true self while getting rid of all the things that prevent you from being your true self, so you can become your true self. People who can sense the upcoming energies say that there are a couple of messages that you should know about this year. Here are the key messages you need to know! 1. Things that were once hidden in the dark will be brought to light. The light will cast upon many of these things either on the personal or on global level. You should not allow yourself to get caught up in the global events as some of them aren’t beneficial. Everything is just part of the change brought about by the infiltration of light in all parts of the world. Things that come up on a personal level need more attention and clearing. These things may shock and even shake you, but you don’t have to be afraid. It’s all for the greatest good. 2. Things from 2011 (7 year cycle) may rise again. Spiritually, the number 7 is a powerful number as it represents the number of our core chakras and also of our body’s cellular structure, which takes place every 7 years. We must remember, though, that we are all in a different stage of a 7-year cycle. The 7-year itch that was to shift 7 years ago will come to fruition and completion. It’s completion in 2018 would be something different for each of us in areas of love, money, relationships, or health. 3. Positive change is taking place in 2018. As 2018 is a year of illumination of self and others, it’s filled with optimism and hope, a place for new beginnings and new shifts. It’s a powerful year for relationships, business, love, and collaboration with others. Like-minded people will work together for the greater cause of humanity and unity. So you can join some cause for the greater good that will in turn bring you positivity and help you advance in your own personal evolution. 4. You hold the light for change. Despite the hardships that you may be going through, you hold the light necessary for change. As long as you remember that you are surrounded by great love, you have the power to change the world for the better through your experiences. Many people look upon you and are thankful for you. Always know that you are magnificent. Look into the seat of your soul by looking into your eyes and then see the glory and grace that you hold.